Love From (and To!) 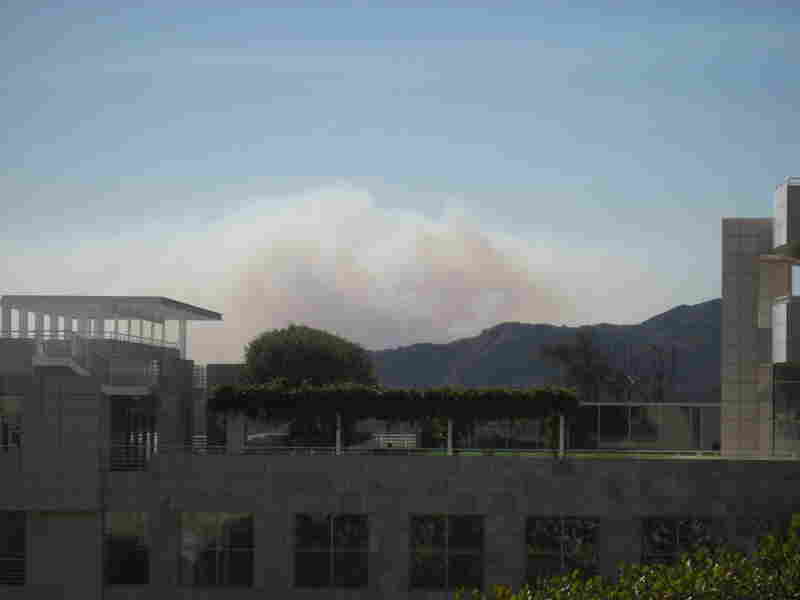 L.A. : Blog Of The Nation An editor's-eye-view of the fires in California, from the relative calm of Culver City. Picture this (or... er... just look at the photo). It's Sunday afternoon, and I've just gone up to the Getty Museum in that darling little tram. The view, as anyone who's been to the Getty knows, is just spectacular. I am a dedicated East Coaster (Red Sox -- not just post-curse, shellfish, Norman Rockwell, etc. ), but I'm learning -- I've been tossing off terms like "freeway," "namaste," and "Santa Anas," like I hope a native would. (It's possible that my legs, which are indistinguishable from a really gleaming piece of sushi-style red snapper -- i.e., seriously white -- might give me away.) I've already heard that the Santa Ana winds are coming in, hence the slightly warmer then average temperatures (that's still only slightly warmer then paradise). Here's where I give myself away. Upon looking out over the Getty's pristine whiteness, I point to a cloud of smoke, and ask a nice man standing next to me whether it's sand from the Santa Anas. He smiles sadly at me and says, "Malibu's on fire." That was Sunday. Now it's Wednesday, and the fires have forced hundreds of thousands of people from their homes. I'm out here working on another great NPR show for a week (though my heart belongs to TOTN), and it's been sad, but fascinating to watch the fires burn from a sort of eye in the hurricane -- between Malibu and San Diego. I had expected a week in which the toughest thing would be getting stuck in line behind Britney at a Taco Bell. Not so. It's overwhelming to see the disaster on television, and then again from the Santa Monica marina. As we wend our way into day four of the raging fires, it's clear that the price that people on the West Coast pay for the gaspingly beautiful scenery -- from beaches to canyons to mountains -- is high. But even the smoky skies can't obliterate the sunsets from the PCH on my way home from work. Here's hoping everybody gets home safely.